The sun was just starting to rise; the temperature was hovering around 50 degrees. Steve Eager was ready – as much as he could be – for the most physically challenging day of his life. It was Sunday, September 7, 2014. The day Eager had been spent months training for – Ironman. 7 a.m. and the gun went off. Donning a swim cap and wetsuit, Eager jumped into the waters of Lake Monona, with a couple thousand other men and women; one stroke after another – the day had begun. 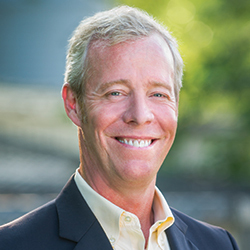 Eager is the President & CEO of Union Bank & Trust Company (UB&T) headquartered in Evansville with locations in Oregon, Belleville, New Glarus and Brooklyn. The Eager family took ownership of the bank in 1916. The bank survived the Great Depression and then the national financial crisis in 2008. Today – UB&T is still strong and poised for the future with a leader who is a driver of adopting new technologies to be the best partner for the bank’s clients. In 2014, Eager’s days became a lot more scripted. He had a bank to run and he wouldn’t let that slip while he trained. 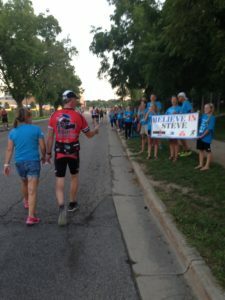 Training began for Eager seven months before the day he joined more than 2,900 others in a grueling 2.4-mile swim, 112-mile bicycle ride and 26.2-mile run. “It was a challenge, but one I knew I could handle because of the great team around me at UB&T,” said Eager. 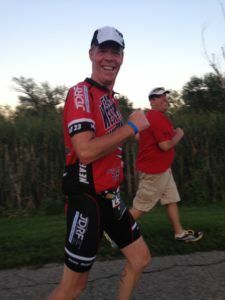 At 52 years old, Eager has a competitive spirit and wanted to prove he could channel it into something as mentally and physically challenging as Ironman. With age comes an aging body. Eager shattered his femur in 1991 while cross-country skiing causing arthritis to set in. In the early 2000’s, Eager tore his meniscus while playing basketball. Those injuries left him skeptical about being able to run a marathon. That skepticism led Eager to train for the run portion of the race on an elliptical trainer. He also had a strategy. There were good training days and bad training days over the thirty weeks of training. An Ironman-in-training puts in hours upon hours in preparing their body. Eager estimates he put in eighteen hours a week during his peak training regime. That’s six days of workouts a week – sometimes swimming in the morning before going into the bank, then running or biking in the evening after work. At UB&T, his co-workers gave him the support he needed to take a little extra time to head to a nearby lake some mornings. His family, especially his wife Amy, knew she might not see her husband until after dark. His friends – some training for Ironman as well – were there when he needed a person in a kayak alongside him navigating the chilly, choppy waters on a brisk morning or pushing him to make the one last climb up Midtown Road on their second time through the bike course. While the support helped push Eager through, it was still a feat he had to finish on his own. Two weeks before the race, Eager caught some sort of stomach bug; he lost ten pounds in just three days. That’s something you can’t plan for in your training spreadsheet. This type of weight loss likely played a role in Eager’s performance in the race, considering the importance of nutrition and muscle mass in endurance events like an Ironman. He could start eating normally a few days prior to race day and felt pretty much back to normal, but Eager couldn’t put back on all of the weight he lost. At one point, Eager was going 45 miles per hour down a large hill called Timberlane. It’s a well-known hill in the area. 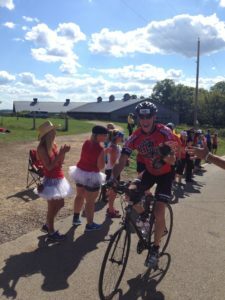 When Eager got off the bike after 112 miles, he didn’t think he could run 26.2 miles. He changed into his tennis shoes and put one foot in front of the other. During the run, Eager saw people in worse shape then he was; people were getting sick on the side of the road. The sight makes you wonder – why put themselves through it? The weather on that Sunday in September was great. It climbed into the upper 70’s. The sun was strong. Throughout the afternoon, the finish line swelled with spectators as they converged to see friends and family come in. 17 hours from the start – midnight was the time to beat. Athletes continued to cross the finish line, as the sun set, with the Capitol building as the backdrop, however, not everyone got to feel the jubilation of rounding the corner of Martin Luther King Junior Boulevard to the sounds of hundreds of spectators cheering. Many athletes didn’t meet the cutoffs throughout the day, and some had to stop because of an injury or exhaustion. It was now 11 p.m. and the crowd grew with excitement as the final hour began. It’s an hour marked with great stories of struggle and perseverance as athletes run, walk and at times, drag their tired bodies across the finish line. As the clock ticked, word spread among family, friends and co-workers who had gathered at the finish line that Eager was just a couple miles away. It sounds close, but the last few miles can be mixed with pain accumulated throughout the day as well as knowing the end is near. Will you be able to continue on when the pain is so great and make it before midnight? Under the dark sky, lit up with bright lights like a runway, Steve Eager turned that final corner toward the finish line. “’Wow,” Eager said. “I did it. It was a lofty goal and I did it. Indeed, he had finished one of the most difficult races a person can do. But the real question – one that many Ironmen get is – will you do it again?